For years, I've made multiple products for my class use and am thrilled to now have a place to sell them and make money. If you don't have a store on Teachers Pay Teachers, what are you waiting for? Downloading is easy; plus, you already have products that you've made. TPT provides a great supplemental income to our high teacher salaries. Bwah! As teachers, we need the extra income, especially if you have kids. From there, everything is self explanatory. I have a highly talented author/artist friend who I got started on TPT. Meet Michael Gravois of GravoisFare. I met Michael from a Memphis writers' group called ABC Writers. We've both been working on multiple children's manuscripts, although Michael is more focused on authoring and illustrating picture books, while I write middle grade and young adult novels. 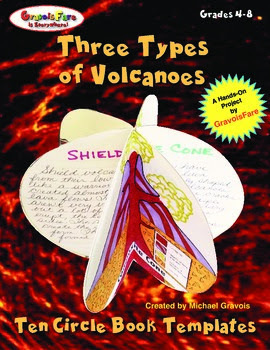 Michael already has multiple teacher books published through Scholastic. Even though he joined TPT a little over a month ago, he's been downloading products like crazy. Michael already has 132 products, and they are selling. It's a circle template book that gives kids directions to help them create a research project. His first day as a TPT seller, I showed him how to pin and pinned it on a few boards. Would you believe I'm still getting people repinning this? All of his products have this same professional quality, so I know he'll do fabulous on Teachers Pay Teachers. He's also written multiple products for social studies, specifically zeroing in on knowledge about each state. He sells state mini-booklets individually or for a true savings, one can buy all fifty state activities at once. or you can check out your favorite state in the product above or as a circle book. and while you're at it, you might as well visit my store. Don't forget to sign up for your own TPT store!